“Children born today have no provision that will guarantee they survive.” — Paramount Chief Charles Caulker, Bumpeh Chiefdom, Sierra Leone. Every newborn life holds the promise of tomorrow. Yet, Chief Caulker’s recent comment is reality in Sierra Leone. But maybe you can grow a baby’s future. Literally. 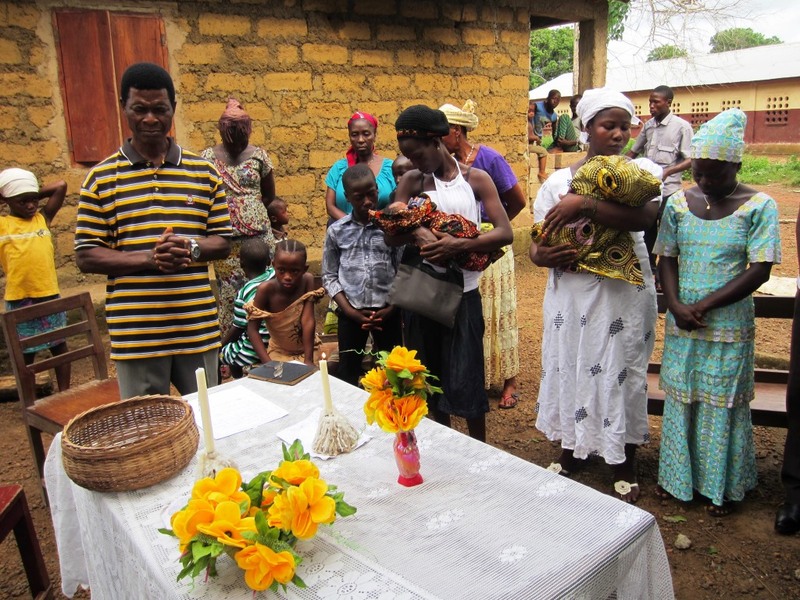 Planting a tree for a newborn infant is an old Sierra Leone tradition. Now, the Center for Community Empowerment and Transformation (CCET) in Rotifunk is kicking off a new program to plant an income-producing fruit tree for each newborn in Bumpeh Chiefdom. And they’re taking it to the next level by opening a bank account for the newborn where income from selling the tree’s fruit can be deposited and grow. In 12 years, it will fund the child’s education. Simple. And that’s why it should work. Being a newborn baby in rural Sierra Leone is tough. The proverbial deck is stacked against them, but it’s slowly getting better. Sierra Leone is no longer among the countries with the top ten infant mortality rates. It’s No. 11, and, that’s a post-war low of 75 infant deaths per 1000 births in 2013 — a 50% drop in ten years. Baby Abraham is a healthy baby. Little Abraham is one newborn in Rotifunk awaiting his tomorrow and what it will bring. Born to a single mother, he crossed his first milestone by successfully reaching his first month’s birthday. A healthy baby delivered in a safe delivery, he now faces the challenge of moving beyond the poverty of his peer group. Children survive only to be stuck in a cycle of poverty as they become adolescents. Breaking this cycle in rural villages is a tough nut to crack. In subsistence agriculture environments like Bumpeh Chiefdom, there’s very little left over after feeding and clothing your family for things like schooling. It’s clear to all that education is one of the biggest keys to escaping the poverty cycle. Yet, sending your kids to the local primary school may be as big a stretch as you can make. Secondary school – often in another town involving room and board – can be an impossibly high hurdle. The Center for Community Empowerment & Transformation has kicked off a new program designed to help Bumpeh Chiefdom parents prepare well in advance for clearing this hurdle. The Newborn Baby Project combines the old tradition of planting a tree for a newborn infant with a new opportunity: savings accounts in a newly opened rural community bank. 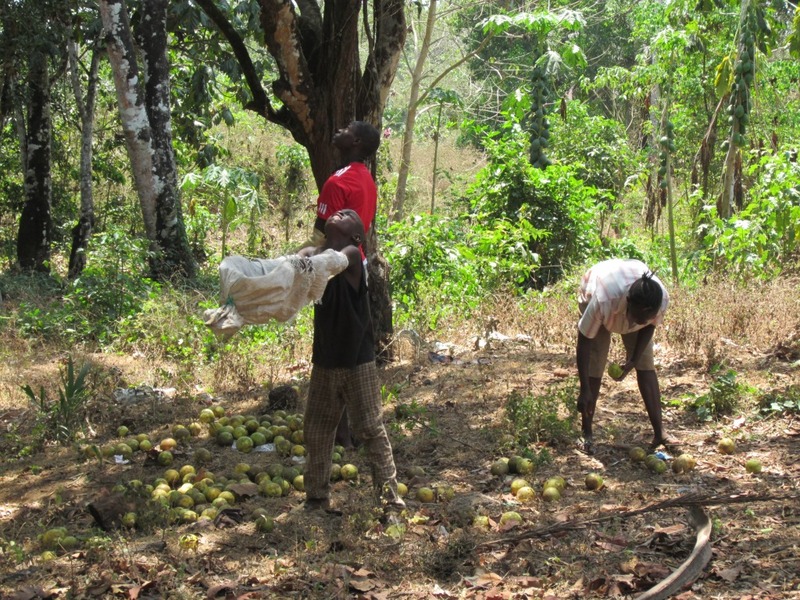 CCET is reinstating Bumpeh Chiefdom’s practice of newborn tree planting by providing fruit trees that will produce $100 of income a year for years to come. They will also initially pay the minimum balance to open an account for the infant in the community bank. Parents are then expected to add to the account with income from selling the tree’s fruit and other savings over time. By the time the child is twelve or fourteen years of age, they should have money to fund their secondary school education and, hopefully, additional money to help their start in life as a young adult. Two mothers at their babies’ naming ceremony. CCET is using another old tradition, the Naming Ceremony, to initiate the program. Parents gather family and friends a week after the child’s birth to officially announce the child’s name and seek blessings for the infant. This is the time to plant the infant’s tree, and allow the child and the tree to grow up together. The innovative part of CCET’s program is to open a bank account for each newborn in their first weeks of life, paying the required minimum balance, and then have income from the child’s tree added over time. Parents are encouraged to add to the account when they can. In the West, we take savings and bank accounts for granted. In October, Rotifunk opened its first-ever bank, a rural community bank. This bank operates more like a credit union does here in the US. Account holders are seen as members and shareholders of the bank. Money held by the bank is invested in conservative investments and income is paid out to shareholders. As a community bank, accounts can also be opened for a small minimum deposit – as small as Le15,000 or about $3.50 USD. Having a safe and accessible place to save small amounts of money has long been a barrier to the world’s lowest-income people saving money. They want to save. But the amount of money they can set aside for saving is usually so small, traditional banks don’t want to bother with this kind of account. Traditional banks also impose transaction fees that can be as large as the deposit or withdrawal the saver wants to make. Add to that, problems with access. Traditional banks are usually located far from small village savers in bigger population centers. With the new community bank in Rotifunk, the Newborn Baby Project will now start providing for the infant’s future within their first weeks of their life. The symbolism of a child and their tree growing up together will be expanded with an income producing tree and a bank account to grow that income. Growing a child’s future – that’s what this project aims to do. Sherbro Foundation is happy to be part of this program by providing initial money to open newborn bank accounts. Let’s talk about the another part of the Sherbro Foundation’s work – helping to spur economic development in a rural community. On my last two trips to Sierra Leone an idea was percolating in my brain that finally crystalized. I recognized I wanted to do something beyond the cycle of donations for traditional nonprofit work supporting education, health, community services and the like. Don’t get me wrong. These are important and much needed. These are a lot of what Sherbro Foundation is doing, too. But I also wanted to do something else. Something more. 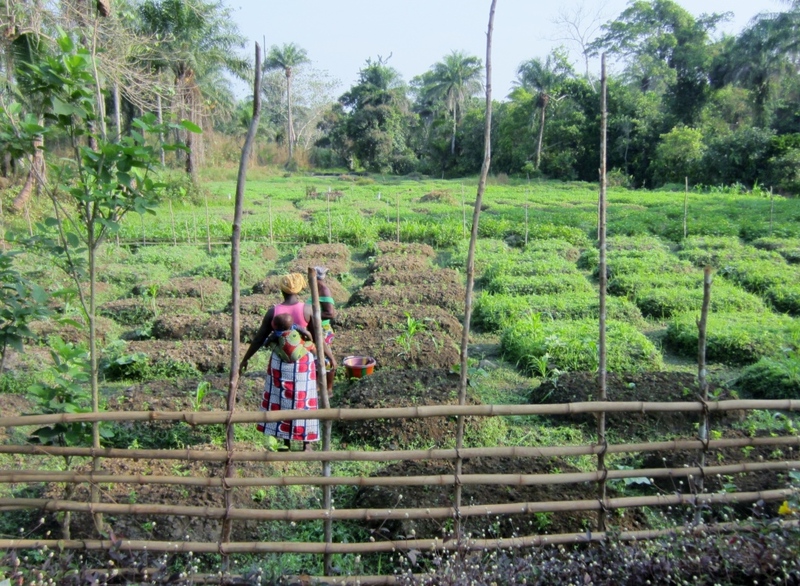 The more is giving the chiefdom a boost in economic development, and their main economic livelihood is agriculture. This chiefdom is blessed with fertile land for agriculture and rivers with which to irrigate. It is lacking the means for most people to develop and expand beyond subsistence agriculture, or to further develop agriculture as a business. Doing more is helping people expand and diversify their family farm crops, increasing their own food security and allowing them to sell a little excess for much needed cash. Doing more is also helping spur small farming business that can expand, and in doing so, create paid jobs where none now exist. Getting jobs with regular paid wages can help people join the “formal economy” where they can then pay their own children’s school fees and buy their own mosquito nets. I was astounded when Bumpeh Chiefdom Paramount Chief Caulker told me what typical cash incomes are in many small villages. It may be as small as 50,000 Leones/year. This is little more than $10 USD. $10 per year, that is. This is the bottom of the subsistence scale, an informal economy of barter. You locally trade or sell small amounts of what you grow. Otherwise, you live off the land, and the fish in the rivers. Or small game you may be able to hunt. Bush beef we called it. You may be able to raise a few goats and chickens. Tending a vegetable garden. Day care on your back. The most disadvantaged are young adults, eighteen and up, ready to start out on the own. Also women divorced or separated from husbands, left to fend for themselves and their children. The families of these groups literally do not have any excess money to loan them to start their farms and vegetable gardens. With no money for tools, seed, and fertilizer, these groups are stuck. Stuck in extreme poverty. The Center for Community Empowerment and Transformation, Rotifunk’s all-volunteer group for community development is beginning to tackle this area by starting a tree nursery for trees of economic value. The idea came up one day on my last trip when we needed to escape the heat of a tropical afternoon in the dry season. Come on, said Chief Caulker, let’s go pick grapefruits. We took chairs beyond his house and down a hill to an old citrus orchard started by his father fifty years ago. I didn’t know citrus trees live 50+ years; maybe the non-hybridized kind. Boys catch grapefruits being picked in mature fruit orchard. Picking fruit meant sending boys to shinny up a tree in their bare feet to drop grapefruits down to other waiting kids. They hold out gunny sacks to break the fall of fruits and not squash them. Then we divvy up the fruit so everyone gets some. We sent someone to find bread and made “sandwiches” for the kids with groundnut paste – roasted peanuts you grind up with an empty bottle on a board. We were enjoying the grapefruits and Chief Caulker reminisced about how he had had “his tree,” his birth tree, and how this is no longer being done. Probably another casualty lost to the war. Your Tree is where your umbilical cord is planted after your birth together with a tree seedling. It grows as you grow, and it’s Your Tree. An old custom in many parts of Africa. A charming and practical custom, I agreed. We need more trees planted in this country. I see fire wood being cut left and right. How are trees being replanted? This led to a conversation about how we should start planting trees and get the new community based organization – the Center for Community Empowerment and Transformation, still an idea, but at least that day drafted on paper – to start this. Four months later, as I write this, CCET volunteers are planting the Economic Tree Nursery. The rainy season has started, and it’s time to plant trees. CCET has started with fruit trees they are germinating from seed and growing themselves to seedlings. Orange, grapefruit, lemon (we call lime) and mango. CCET will transplant seedlings to small polythene bags and nurse them til next season, when local people can buy them at a small nominal cost for their farm or garden. Mr. Sonnah, agriculture teacher and CCET volunteer explained, people take things more seriously when they have to pay something for them. Same thing at home, I said. These small fees will go back to purchase materials to start new seedlings each year. Mr. Sonnah said getting fruit trees will improve a family’s food security, giving them another food source and diversifying their diet. Fruit trees are typically planted near rivers and streams, helping keep them watered. As trees mature, they then protect the water catchment area. Trees are like sponges, taking up water, and their roots prevent run-off and erosion in the heavy tropical rains. These water filled trees then help keep streams from easily drying up in the dry season. People will need chiefdom permission to cut down economic trees and pay a small fee, as well as replant the tree. This is to discourage trees being cut for firewood. Acacia, a fast growing “weed tree” can be used for fire wood. 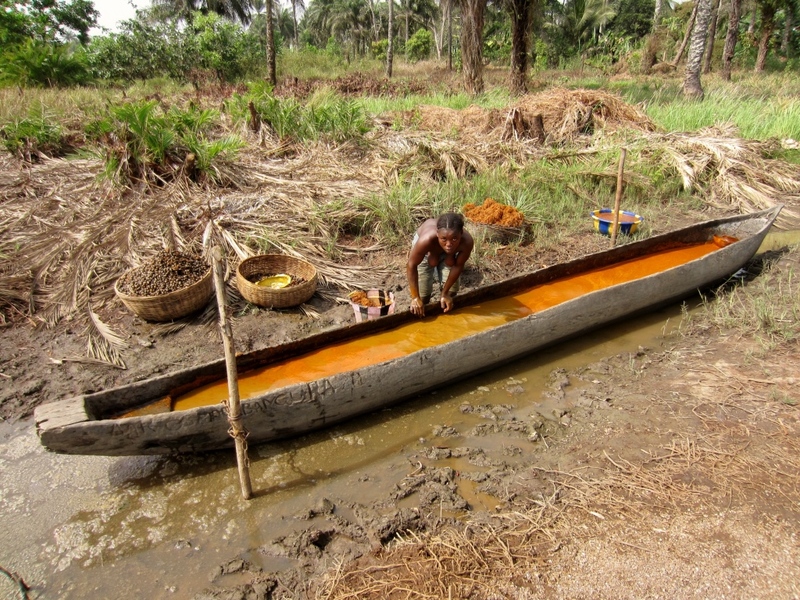 Village woman extracting oil from palm fruits in her canoe. CCET is also starting to nurse oil palm seedlings they bought from Njala University’s agriculture school. Oil palms are native to Sierra Leone, and the oil from the palm fruits is a mainstay of the local diet. Palm oil is increasingly used globally for a variety of applications, and is a good cash crop. The Njala seedlings are a new variety that will produce faster, fruiting in about four years. Nine hundred teak seedlings from another source have also been added to CCET’s tree nursery. These need special care with careful pruning and cultivation as young seedlings. Next rainy season they’ll be bigger and stronger, and ready to be sold and transplanted again for future lumber harvesting. CCET will organize workshops and 1:1 training on how to plant and care for all the trees that will be sold. With 60% of the country’s population under 24 years of age, these are skills that were lost in the war years and now needed for young adults and women needing to become farmers. The custom of children getting “their tree” will start again, as well. CCET will ensure each child has a tree planted at birth. In this way, you will also be able to tell how many children were recently born in a village by counting the number of new trees. This project is a good example of how a few people can make a big difference when they work together and just get going on a practical first step. Many benefits follow this project: economic development, food security, environmental protection, protecting cultural traditions, empowering youth and women as farmers. Sherbro Foundation is glad to have contributed the funding to buy farm tools for the tree nursery and the oil palm seedlings.